Brighouse Town manager Paul Quinn was delighted with his players’ response in Monday’s pulsating 2-1 home win over Scarborough Athletic. “This was a great result for us after the 5-1 defeat here last time against Witton Albion,” beamed Quinn, who carried out his threat to give all the bench players in that loss a start against Scarborough. “It was no classic but the lads showed great character, dug in and battled for every ball and set the foundations for the next 20 games as we aim for the play-offs,” he added. “It was a real blood and thunder game with no quarter given and I thought the referee and his assistants did well. “I thought, given the conditions and the type of game that transpired, debutant Ben Atkinson did well. Atkinson, a 20-year-old central midfielder from Norton Tower, Halifax, is on loan from Curzon Ashton. He was formerly on Huddersfield Town’s books and is from a well-known cricketing family connected with Halifax League club Warley CC. Town now turn their attentions to tomorrow’s trip to the Giant Axe to play Lancaster City and could have left-back Chris Fisher back in the fold. Quinn added: “He was due to play some part in Monday’s game after missing with flu last week but he phoned on Christmas Day to say he wasn’t fit to play at Ossett Albion and was doubtful for the Scarborough game – something he later confirmed on the Sunday. City won 3-2 at Prescot Cables on Monday with goals from Tom Kilifin (2) and Terry Cummings. New manager Philip Brown took over in November from Darren Peacock and Trevor Sinclair. Lancaster lie 12th after 21 games on 27 points, four places behind Town, who are in eighth on 34 points. Brighouse are four points behind fifth-placed Burscough, who occupy the last play-off place. 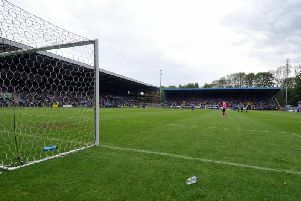 Brown has recently brought in two players on loan from higher placed clubs, defender Jacob Gregory from AFC Fylde, and midfielder Charlie Russell from Stockport County. Town drew 2-2 at the Dual Seal Stadium with City in October when they felt they should have won easily. Experienced striker Daniel Facey missed Monday’s game with a knee injury sustained in the Witton Albion game. He has had treatment this week. Brighouse are putting on a coach to Lancaster, leaving the ground at Hove Edge at 11am. The cost is £10, ring Charlie Tolley (07841 132118) to book.